If you’ve ever wondered how to make chicken broth from scratch, the good news is that it’s quite simple! All you need is a handful of quality ingredients and some time, and you’re on your way to a rich and delicious homemade broth to use in all your favorite recipes. Growing up in an Eastern European household, I ate a lot of chicken soup. Both of my parents knew how to cook, but it was typically my momma that made our meals. And with our meals there was usually always some kind of soup as a starter to the meal, often homemade chicken soup. She would use one of our extra large pots for this preparation, because she would place a whole chicken into that pot, along with lots of colorful vegetables (whatever we had on hand—it was a good way to clean out the fridge) and an array of aromatics such as onions and herbs. Then she would cover all of those ingredients with water, and allow that to simmer for hours and hours. It bubbled gently on the back of the stove with the lid slightly askew, until it became deeply golden and rich with chicken flavor, filling the entire house with amazing aroma. Each of us had our own way of enjoying a bowl of that delicious chicken soup. My dad would fill his bowl with the thin noodles we used, along with the over-cooked vegetables from the pot (waste not, want not), and the chicken saved from the bones to create a more hearty and filling meal. But I preferred to fill my belly with only the noodles and the savory and soothing golden liquid which offered me such warmth and comfort. Ultimately it was a rich and delicious chicken broth that was at the center of it all, only slightly embellished with some noodles, veggies and chicken. And it’s that kind of broth that makes a perfect base for many other soups and recipes. 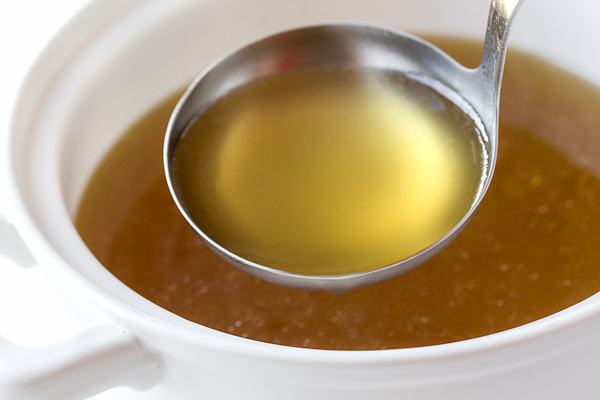 So here’s everything you’ll ever need to know about how to make chicken broth, from scratch! 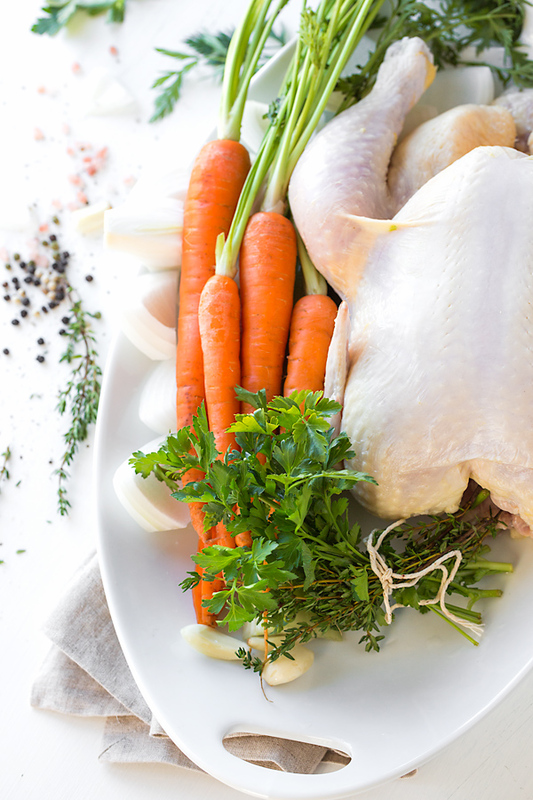 What Goes Into a Basic Chicken Broth Recipe? Typically, when it comes to chicken stock, the carcass or bones from a chicken are used in the preparation of it. But because I like to use a whole chicken for stronger flavor—meat, skin, bones and all, I’m actually preparing a chicken broth with an incredible richness and depth to it. Vegetables are essential to creating a broth and I opt to use a ratio of four medium-size carrots, three ribs of celery, one large onion, and four small cloves of garlic in my homemade chicken broth. Other veggies that can be included are kohlrabi (my mom used this in hers often times), parsnip, or even turnip—but know that the latter two may add a slight hint of sweetness. I also tie together a generous bundle of whatever kind of herbs I have on hand—typically flat-leaf parsley and thyme—with a bit of kitchen string, which helps make removal easier later on. And then a small palm-full of black pepper corns and a good dash of either Himalayan pink or sea salt are tossed in to create some savory-ness. All that’s left is to fill the pot with cold water, roughly enough to cover the chicken by a couple of inches, so that the flavor remains nice and strong. 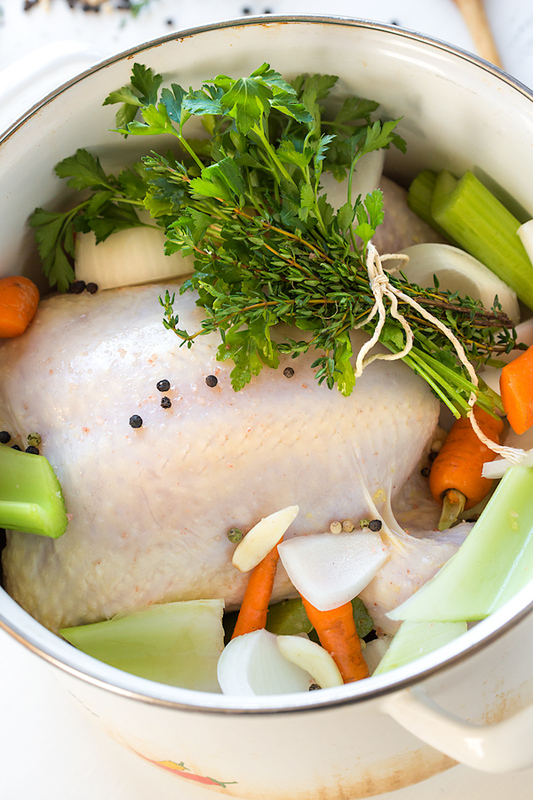 Begin by placing a washed, whole, organic chicken (giblets removed, but neck bone reserved) into a large, 8-10 quart pot. Then add in the celery, which is roughly chopped into large pieces, followed by the carrots (also roughly chopped into large pieces), an onion (simply peeled and quartered), and the whole, peeled garlic cloves. Tie together a large fistful of herbs such as parsley and thyme and toss those in, along with a small fistful of pepper corns (you can use black or multicolor) and about 2 tablespoons of salt. Finally, taste it to see if any additional salt is needed, and either use the broth directly, or allow it cool completely before refrigerating. Or you can portion it off and store in heavy-duty ziplock bags in the freezer for use in later recipes. And now, you have a delicious homemade chicken broth that I’m sure you will find truly delicious when you’re making all your favorite soup recipes. Hope you enjoy! Use good quality chicken: Use the best quality, whole chicken you can find. If you can afford organic chicken, that is ideal; the flavor is more intense and will provide for a healthier, better tasting broth. Go large with the soup pot: I use a soup pot that is about 8-10 quarts, because space is needed in order for the whole chicken to fit easily, along with the veggies and water. Patience is a virtue: In order for chicken broth to be as deep in flavor as it can be, allow for about 4 hours of simmering. I like to prepare mine earlier in the day so that it is ready in the afternoon. But if you are pressed for time, allow for at least 2 hours, and the flavor should be pretty good at that point. Strain, and if needed, strain again: I usually very carefully lift the chicken out of the hot broth with a pair of tongs and set it in a bowl. Then, I strain the broth of all the veggies, herbs and peppercorns into a clean pot, and often re-strain for even more clarity, as needed. Cool completely and then freeze for future recipes: Allow your clarified broth to completely cool before freezing it for future recipes; you can keep whatever amount you need for more immediate recipes in the fridge in a covered container for up to 5-7 days. You can portion off quantities for future soups or other recipes in heavy-duty freezer bags and then defrost in the fridge as needed. 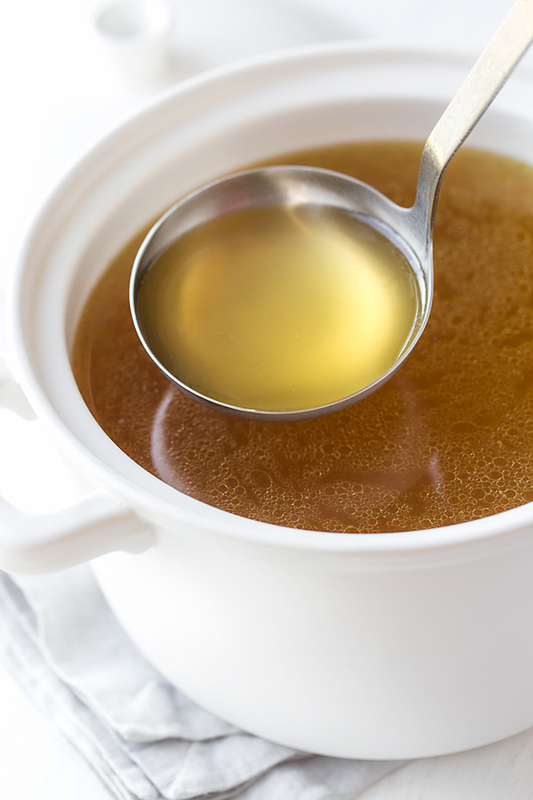 Homemade Chicken Broth is a classic kitchen staple sure to take your homemade soups, sauces and all kinds of recipes to the next level! -Place your chicken and the remainder of the ingredients into a large soup pot, and add 3 quarts of cold water. -Place the pot over medium-high heat and bring to a vigorous simmer/boil, then cover with a lid slightly askew, reduce heat, and very gently simmer for 4 hours (at least 2). -Carefully lift the chicken out of the broth, and set aside (you can shred the meat for another use if you’d like, just know that it will be pretty overcooked). Then, strain the broth of all the vegetables, and restrain with a finer mesh strainer for extra clarity. -Use immediately for your recipe, or allow the broth to cool completely and portion off quantities in containers or heavy-duty ziplock bags to keep in the freezer to use for future recipes. Check out some of our most popular soup recipes to use your delicious, homemade chicken broth in! Oktoberfest Stew, Zesty Mexican Chicken Stew, Summer Corn Soup with Shrimp, Simple Lemony Chicken & Spring Veggie Soup, Hearty Italian Chicken & Autumn Veggie Soup. 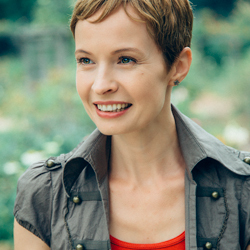 Ingrid, what do you do with the actual chicken? It seems a shame to throw it away. Hi Ingrid! I’ve become hooked on making broth almost every weekend for quite a while now. Your recipe is gorgeous and wow that colour is certainly liquid gold! I’ve become a bit of a hoarder now with any bones, raw or from roasts or BBQ’d dinners plus healthy looking veggie peels or trimmings I’m not going to eat.I throw them all into a bag in the freezer then I have almost everything I need for free delicious broths/stocks. Also doing it in the pressure cooker makes it faster especially for bones that need a lot longer than chicken. Sue, it is absolutely brilliant that you do that; it’s classic kitchen technique, especially restaurant kitchen where there can be zero waste. 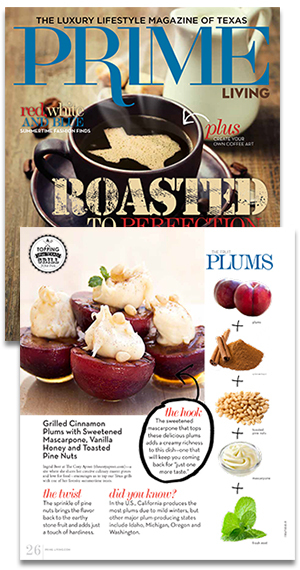 So saving those peels & scraps is the perfect thing to do! 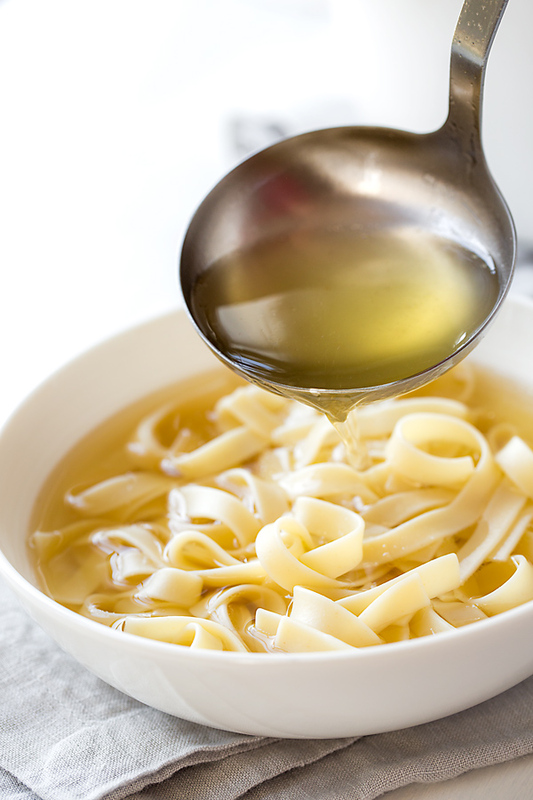 Kudos to you for making your own broth so often; not only are you saving money, but homemade broth truly makes a difference in the flavor of your recipes, doesn’t it? Thanks so much for commenting! I can’t stand food waste! Food here in Australia isn’t cheap so yes we should make use of as much as we can plus I am a animal lover and sometimes have issues with eating meat because of that but find it hard to stop as I wasn’t raised vegetarian (I’m also from European parents like you) so then it’s even more reason to make use of the whole animal as best we can. Also if you waste less on food then you get to travel more and try new things 🙂 win win! What do you do with the neck bone & giblets? Hi Lisa, great question! I cook up the giblets for my dog, lol, and the neck bone you can totally include in the cooking process for the broth! Hope you enjoy! Do you remove some, all or none of the fat that will result from the process? I know some chicken fat is good, but it seems there will be quite a bit left from the skin. I make my own dog food and after hours of cooking the meat in a crockpot I take out the meat, chill the broth, and then just lift off the hard layer of fat that rises to the surface. Should/could I do that, but leave a small amount of it in the finished broth? First time doing this with chicken, can you tell? But I’m losing faith in commercially prepared foods more and more. Yes, there is a fairly good amount of fat leftover, and I would say that the amount one leaves depends on one’s taste. If you like a bit of richness or that “mouth feel” or depth that the fat creates, I’d say leave it all since it isn’t actually a ridiculous amount, especially once you warm it up and it disperses. However, I, myself, have often times skimmed some of the fat off the top once I’ve chilled it in fridge. I’ll usually only do 1/3 to half, and leave a bit; but you can certainly remove all of it you if you prefer. It’s all your personal preference. I really hope you enjoy the recipe should you choose to prepare it! Can you do this recipe in the crock pot? If so, how long would you leave it in? I plan on cooking the whole chicken and saving that stock. Then, I have 2 chicken carcasses in the freezer, I will pull those out and put all three back in the crock pot to make more broth. Hi Abby, you sure can! I would actually add all of the ingredients—even the carcasses—into the crock pot at the same time (if it’s large), cover with water (do everything as directed by the recipe), then set the crock pot to “low” and allow things to gently simmer for 8-12 hours. Will a mason jar break if I freeze the broth in it? Hey Jessie, you can use a mason jar if you prefer! Keep in mind that liquid expands when frozen, so be sure to leave about 2 inches of space at the top. Also make sure that the jar itself and the liquid (broth in this case) is completely cold before placing into the freezer. I’d recommend that you first place the mason jars with broth into the fridge to cool completely, then place into the freezer. What about the veggies i plan on making chicken n dumplins. Is it ok to continue with the veggies already in there or should I just throw them away? Hi Angela, it’s really up to you! They will be quite over-cooked and sort of mushy because of how long the broth takes; but honestly, I myself have saved them for my hubby on occasion, at his request, when I’ve made homemade chicken and dumplings. 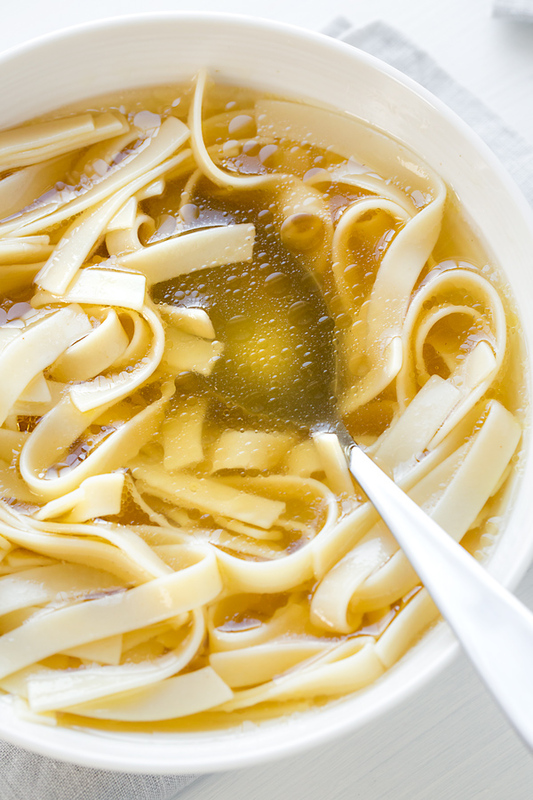 How do you thaw your chicken stock when you need to use it? You could also leave it out on the countertop at room temp for the day to expedite things, and as soon as it begins to soften, you can add it to a pot and slowly heat. So after you cook the whole chicken in the broth, do you cut up the chicken into pieces for chicken noodle soup? You certainly can do that; but because this particular recipe is geared more for preparing broth (long cooking process) rather than chicken soup, the chicken becomes quite overcooked since it cooks for so long. Funny enough, my dad used to enjoy the chicken from this long cooking process anyway—it never bothered him, lol! But I would advise that if you plan on using this delicious broth to go the step further and create chicken soup with it, use juicier chicken. I, personally, would prepare the broth as I direct in the recipe (strain, etc. ), and then use a separate cooked chicken (rotisserie for convenience) cubed up and included for soup. As I said, you certainly can use the chicken from the broth; but for more juicy, plump results, cube up a rotisserie chicken for the actual soup.